Picture where you would like to go! You are a lover of wine but also prefer the road less traveled. Perhaps you will go to the southern shores of Lake Garda, to the ancient Roveglia farmstead, considered the only remaining example of 15th century Lombardy architecture in the area. The land hides a terroir whose history goes back 200 million years. Old vines, in unison with clayey soil yield Lugana, better known as Trebbiano varietal. That is our expression of choice this Wine Wednesday: Tenuta Roveglia Vigne di Catullo Lugana Riserva 2012 (LCBO VINTAGES#: 437004 | $23.75 per 750 ml bottle). It has an intense straw colour with golden reflections, both robust and velvety. The grapes have been selected with care from vines that are over 55 years old. 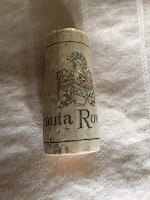 It has a particularly rich bouquet where colder, mineral notes harmonize with ones of ripe fruit. Because of its rich aroma with notes of toasty oak and an almond fi nish, it lends itself as the perfect accompaniment to fish, pasta dishes, grilled meat and cheese. Sukasa Tasting Notes: Light gold in appearance, the initial nose betrayed a hint of grass and upon further reflection there was a candied but not saccharin element to the bouquet. The taste was a revelation with subtle honey and melon notes. The finish was smooth and silky --almost 'oily'-- and an appropriate for this medium bodied flavourful and aromatic entry. The recommendation is to pair this with chicken, game, and fish. We suggest serving at 10°C and this is a white that will not suffer from being chilled further. 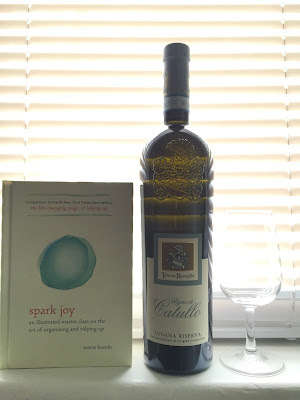 Books & Wine Pairing: Picture how you would like to live your life! Happy and clutter-free? Pair the Vigne di Catullo with Spark Joy. It hints of the possibilities of a finer life that is within your control. Read the full review of Spark Joy - an Illustrated master class on the art of organizing, tidying up, and decluttering the KonMari way from the New York Times best-selling author Marie Kondo.